Wheaton Terriers make excellent therapy dogs given their sweet personality and temperament. These smart, strong hypoallergenic dogs need high quality nutrition to keep them going, and it is the owner’s responsibility to make sure that they are getting everything they need in that department. 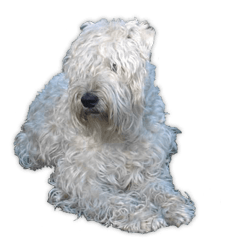 So what are some of the best foods for soft-coated Wheaten Terriers? Let's get to it. Lively, playful, gentle, curious and independent. Protein Wasting Diseases (PLN and PLE), Renal Dysplasia, flea allergies, hip dysplasia, von Willebrands Disease and Progressive Renal Atrophy. The Wheaten Terrier is a medium size dog that is considered agile, strong and well coordinated. Loves children and they make great watch dogs. In general they get along well with other dogs. Though active and strong like other terrier breeds, Wheaten Terriers are known for being gentler, and cuddlier than their relatives. Wheaten Terriers are athletic and should get a good daily dose of exercise to stay happy and healthy, making them the perfect choice for active families and singles. Wheaten Terriers came to the United States from Ireland and is considered one of the oldest Irish dog breeds. They became famous for being working dogs used for guarding, hunting, and herding. These days the breed does well at obedience, agility, and tracking competitions. In terms of activities the Wheaten requires moderate exercise. Daily walks or play time in the yard will do. H﻿﻿﻿﻿ealth-wise, the Wheaton is prone to protein wasting disease and can develop flea allergies. 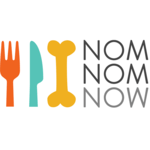 What to feed and how much to feed a Wheaten Terrier? 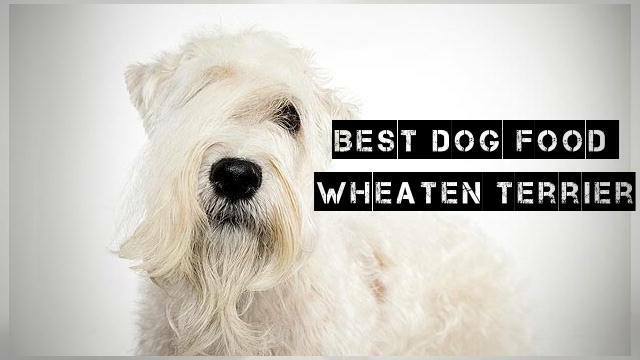 To get all the nutrients that they need to support their energetic lifestyles, Wheaton Terriers should be fed a diet of high-quality dry dog food or a homemade diet. When looking for a good dog food brand, owners should focus on finding a blend with ingredients designed to improve dogs’ skin and coat. A few highly recommended dog food blends that Wheaten Terrier owners may want to consider are Wellness CORE grain-free, Pure Vita, Earthborn Holistic, Castor & Pullox Organix and Orijen Regional Red Grain Free. These hypoallergenic recipes include a lot of natural ingredients, added antioxidants for immune support, and healthy oils for skin and coat health. These brands focus on putting dogs’ nutrition first and owners can see the difference when they switch their dogs from cheaper brands to these specially designed formulas. Like most medium sized dogs, owners typically feed their Wheaton Terriers twice a day. Once in the morning and once in the evening is a routine that dogs usually do well on. Other breeds of terriers are grazers, so it might be okay to let your Wheaten Terrier eat smaller meals throughout the day if they don’t overeat. Owners should always make sure that their Wheaten Terriers have clean, fresh water available. If they have any questions about how to make sure they are feeding their dogs right, owners should feel free to consult with their vet. When deciding how much to feed any dog, owners should consult the instructions on their dog food and consider their dog’s breed size, weight, and age. Every dog is different, and owners can adjust their dog’s diet based on their activity levels. Since Wheaton Terriers suffer from issues like hip dysplasia, it is important that owners make sure they get enough exercise and aren’t overfed. Being overweight makes health issues like hip dysplasia a lot worse for dogs. Protein Wasting Diseases (PLN and PLE): symptoms caused by the loss of proteins from the gastrointestinal tract or kidneys. A few symptoms of these diseases are vomiting, weight loss, and increased water consumption. Renal Dysplasia: abnormal kidney development that can lead to early kidney failure. Some symptoms of RD are increased urination, vomiting, and reduced appetite. According to a recent article published by PetCareRx, dogs already affected by Renal Dysplasia can hugely benefit from a diet that is low in salt and can metabolize easy. Hip dysplasia: an inherited disorder that results in improper development of the hip joints and loss of functioning in the hip joints. This disease is common in large dogs and can be reduced by watching a dog’s weight. Ingredients like glucosamine and chondroitin along with a healthy diet can help promote a dog’s joint health. Progressive Renal Atrophy: Progressive Renal Atrophy affects dogs between 1 and 8 years of age. This is a degenerative disease that results in blindness, and doesn’t show a lot of the symptoms like redness that are typical with other eye problems. Owners might notice a shift in their dog’s behaviour like not wanting to go down stairs or losing their way in the dark. Ingredients like carrots, broccoli, and sweet potatoes are good for dog’s eye health, so owners can try to include those in their dogs’ diet to keep their eyes healthy for a long time. First Five Ingredients: Deboned Turkey, Turkey Meal, Chicken Meal, Peas. 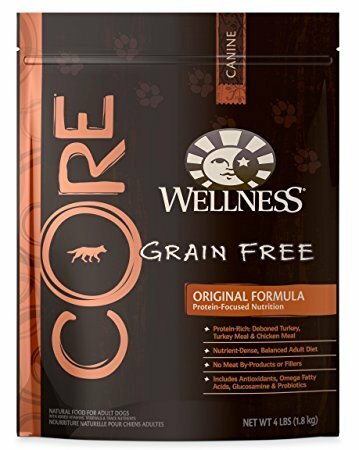 Wellness CORE Grain-Free Original Deboned Turkey, Turkey Meal & Chicken Meal Recipe is a grain-free dry dog food blend that focuses on giving dogs everything they need to fulfill their complete nutritional needs. This formula is made in the USA using only premium, natural ingredients like turkey, chicken, real vegetables, vitamins, and minerals, with 421 kcal/cup and 100% gluten-free. The recipe is fortified with all the important ingredients dogs need to give them energy, support a healthy immune system. Wellness CORE also helps dogs maintain a healthy digestive system, skin, coat, eyes, teeth, and gums. This formula offers 34% crude protein and 16% fat, plus it is designed to support your dog’s lean muscle mass. Wheaten dog owners love this dog food because it's a great choice for dogs who need to watch their weight. Some owners have noticed that switching to this brand can help dogs with digestive issues caused by beet pulp, a stool hardening ingredient found in many premium dog foods. Wellness CORE is also known to reduce skin irritations and give dogs more energy throughout the day without having to eat as much. If your Wheaton pup can’t eat some of the ingredients in this food, Wellness has a number of other formulas with some novel proteins. First Five Ingredients: Salmon, salmon meal, peas, sweet potato, pea flour. 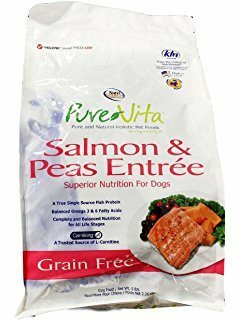 PureVita™ Salmon Formula Grain Free Dry Food made by NutriSource® offers dogs an easy to digest kibble especially formulated for complete nutrition for dogs of all life stages. 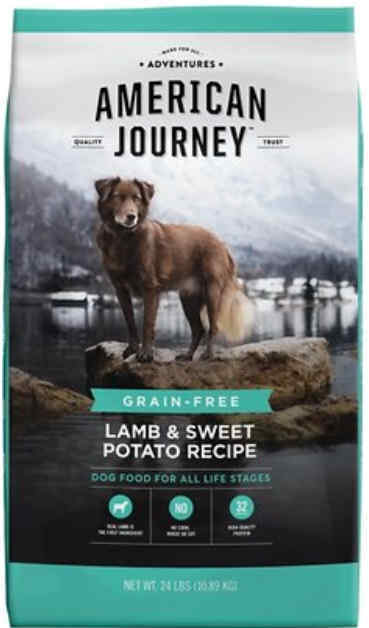 This grain-free formula is great for dogs with allergies or sensitivities combining tasty salmon with wholesome sweet potatoes and is fortified with Omega 3 and 6 fatty acids for healthy eyes, teeth, skin, and coat. Pure Vita is also rich in antioxidants to help dogs maintain a healthy immune system and L-Carnitine for muscle and heart health. A few of the main ingredients in this recipe are salmon, peas, sweet potato, cranberries, and blueberries. It's free of poultry which can be a common allergen with Wheatens. This recipe offers crude proteins of 26% which is above average, crude fats of 15% which is near-average of what is recommended and carbs of 35% which is below-average when compared to a typical dry dog food. The calorie count is 438 kcal per cup. This highly rated blend is a first choice for dog owners who want to give their dogs healthy, natural food without any surprise ingredients. Owners love Pure Vita Grain Free Dog Food because picky eaters enjoy it, it is easy to digest, and doesn’t cause allergic reactions like other dog food brands that contain ingredients like grain, corn, and soy. It's formulated by (AAFCO) Dog Food Nutrient Profiles for All Life Stages so can be fed to an adult, puppy or senior dog, including all life stages including growth of large size dogs (70 lbs. or more as an adult). Available in: 5 lb., 15 lb. & 25 lb. bags and there are approx. 20, 61 and 102 cups of food in each respectively. Overall this recipe is an excellent choice of hypoallergenic dog food for your soft-coated Wheaten. Wellness CORE and Pure Vita provide dogs with complete nutrition using healthy protein, fruits, and vegetables as their main, natural ingredients. Dogs who are fed these blends suffer from fewer health problems and have more energy to spend time with their families.